There is a clock face with the correct (target) numbers written in circles. But somebody confused the clock face and created a crazy clock with numbers written in ellipses. Your task is to repair the clock face by moving individual numbers one by one around the clock's perimeter and also using the four drawn lines that form a cross. In the center of the cross there is an initial empty place. The 12 numbers and the empty place form 13 connected fields. How many and which moves do you need to repair the clock by moving the numbers according to the rules above? The picture shows a clock face with numbers inscribed into rings. Above them the clock face in an oval is confused (1-12). 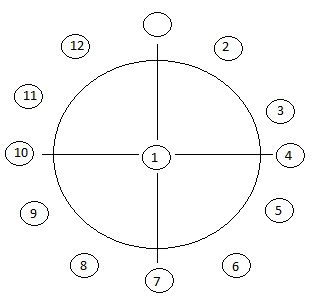 Your task is to repair the clock face by moving the single digits along lines - around the perimeter and along the cross with an empty ring in the middle - consists of 13 fields with links. How many moves it takes to make a crazy clock face fixed to normal hours. Describe the steps to solve the puzzle. I solved it with a computer program. The algorithm is pretty naive - at every step I build a list of possible states using all possible changes to the states of the last step. Of course, only the following 4 things are considered steps - moving a number into the centre, if it's free (one of 4 options); moving out of the centre, to the free slot; moving 3 numbers clockwise, if possible; or moving 3 numbers anticlockwise, if possible. Also, I remember the previous step for each state, so I don't just retract it. And, once I've built the whole list of possible states I discard any duplicates before moving on to the next step. At the final step I have 781086 possible states, one of which is the solution. # 4: from which slot we moved from/to centre (when relevant). In finding the solution it built all $5,379,522$ unique states reachable using up to the number of moves required (including the start state; stopping once the solved state was found). Each state is saved with a reference to the state from which it was reached, which allows the print of the path taken. Shift the top left corner in CW direction by 1 notch. this means : place 1 in center, blank goes CCW from North to West, which means that the numbers in the quarter of circle go CW, then put 1 back in blank. We now have $(6, 7, 8, 9, 10, 11, 12, 1, 2, 3, 4, 5)$ which is not the solution, but it is 6 notches away (180° rotation), which seems much more favorable. Put 12 in the center, make 5.5 full turns in either direction, and place 12 in North. This makes a total of $145$ moves. I think that shorter solutions can be found by bruteforcing. Sorry for no visuals, I'll try to add some later. EDIT: Updated, I seem to have written some steps wrong by accident. Bold steps were changed. 1. Move 1 to the centre. 2. Move 12, 2, 3 counter-clockwise one step. 3. Move 1 to the right. 4. Move 12 to the centre. 5. Move 9, 10, 11 clockwise one step. 6. Move 12 to the left. 7. Move 1 to the centre, then move 2, 3, 11 clockwise one step. 8. Move 12, 9, 10 clockwise one step, and move 1 to the left. 9. Move 2, 3, 10, 11 counter-clockwise one step so that 11 is on top, leaving the empty space in the middle. 10. Move 1 to the centre, and move 12, 9, 11 counter-clockwise one step. 11. Move 1 to the top. 12. Move 1, 2, 3, 10 clockwise one step. 13. Move 12, 9, 11 clockwise one step. 14. Move 10 to left space. 15. Move 3 to centre. Move 11, 1, 2 clockwise once step, then move 3 to the top space. 16. Move 10 to the centre. 17. Move 12, 9, 3 counter-clockwise one step. 18. Move 10 to the top space. 19. Move 12 to the centre, move 9, 3, 10, 11, 1, 2 counter-clockwise one step. 20. Move 12 to the right. 21. Move 9 to the centre. 22. Move 3, 10, 11 counter-clockwise one step. 23. Move 9 to the top. 24. Move 12 to the centre. 25. Move 9, 1, 2 clockwise one step. 26. Move 12 to the top. 27. Move 3 to the centre. 28. Move 10, 11, 12, 9, 1, 2 counter-clockwise one step. 29. Move 3 to the right. 30. Move 9 to the centre. 31. Move 10, 11, 12 clockwise one step. 32. Move 9 to the left. Somewhat more general answer, since the specifics are well taken care of. Warning: Math ahead. Label each of the positions around the clock from 1 to 12, so that in the 'correct' clock 1 is at position 1, 2 is in position 2 and so on. Label the center of the clock '0'. 1. Move number at 3, 6, 9, or 12 to center. 2. Rotate every number around the circle exactly once either clockwise or counterclockwise, leaving the same space at 3, 6, 9, or 12. Repeat zero to five times. 3. Rotate a group of three, six, nine, or twelve numbers adjacent to the position you just moved the one space either clockwise or counterclockwise. 4. Return center number to the gap, which will have shifted three, six, nine or twelve spaces around the board, therefore still being reachable from the center. (10, 11, 12, 2, 3, 4, 5, 6, 7, 8, 9, 1). (2, 3, 1, 4, 5, 6, 7, 8, 9, 10, 11, 12). Note that this is just a combination of the other two types. Now let's do a bit of math- specifically, let's look at Permutations. Moves of the first kind where we shift $n$ numbers clockwise result in permutations of the form $(a, b, c)$ where $a$ is the number moved to the center, $b$ is the number that was immediately clockwise to it initially, and $c$ is the number that was $n$ spaces counterclockwise to it initially (and ends up immediately clockwise to it after the move). Counterclockwise is similar. Moves of the second kind where we move the number $a$ at position $m$ to position $n$, rotating numbers that are clockwise from position $n$, where $n, m$ are 3, 6, 9, or 12 and $n \neq m$, give permutations of the form $(a, b, c)$ where $b$ is the number at $m$ and $c$ is the number immediately clockwise from $n$. Counterclockwise is similar. Even if $(a, b, c)$ does not correspond to some valid move of the first type, note that for any $d$ it is true that $(a,b,d)(a,d,c) = (a,b,c)$, and for any $e,f,g$ it is true that $(e,f,g)(a,b,d)(e,g,f)(a,d,c) = (a,b,c)$. Additionally, if $(e,f,g)$ is a valid move of any kind, or if there is an equivalent set of moves which ends by moving $e$ to position 3, 6, 9 or 12, then once $(e,f,g)(a,b,d)$ is applied $(e,g,f)$ is guaranteed to be valid as long as none of $a,b,d$ are equal to $e,f,g$. Applying (1,12,2) (a type 1 move) would instantly fix the order, as noted by Sechiro. This is equivalent to (12,2,1), which would only work if 12 was already at the top with a 2 next to it, which is equivalent to (12,2,9)(12,9,1), which is the same as (3,4,11)(12,2,9)(3,11,4)(12,9,1) if (3,4,11) is a valid type-2 move since it would ensure the conditions of (12,2,9) are met. It isn't valid since 11 isn't at 3, 6, 9 or 12, but (3,4,2)(3,2,11) at long last is valid, and is equivalent to it, so the full sequence (3,4,2)(3,2,11)(3,4,11)(12,2,9)(3,11,4)(12,9,1) keeps the order of (1,12,2), while ensuring 12 ends up at the top where it belongs. This method could stand some fine tuning as it still relies a bit on intuition and while it happens to come across an optimal solution in this case I can't think of a reason why it should in general, but it generalizes across any starting or ending position and it should generalize easily with some proof finagling across any layout of clock. 1. Put the 1 at the center of the clock. 3. Move the 1 up. 4. take the clock off the wall. 5. Put a new adhesive at the back under the 12 and remove the one under the 1. 6. Put the clock back on the wall. I must be missing something... Is this the answer? 1. Slip the 1 down into the center spot. 2. Move the 12 anticlockwise one space. 3. Rotate the outer circle anti-clockwise one notch (so now the vacant circle is at the 12 o'clock position). 4. Move the 1 from the center up into the vacant circle. 5. Finally, rotate the outer circle clockwise one notch.